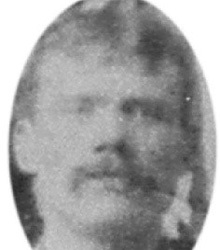 Alex Geddes (Forward, 1881-91) – The Geddes family were among the many miners who came to Cowdenbeath to live in the Moss Houses at Landale Terrace and work in the Raith Colliery. Harry Geddes aged 25, Bobby Geddes aged 23 and Alex Geddes aged 21 all then began playing football with Raith Rovers when that club was formed in 1881. In 1882, Raith Rovers merged with Cowdenbeath Rangers to form our present day Cowdenbeath FC. All 3 brothers were prominent in the early years of the fledgling Blue Brazil. Alex enjoyed the most successful career and was a regular scorer for the side. He was a member of the sides that won the Fife Cup in 1885, 1889, 1890 and 1891 as well as the Dunfermline Charity Cup in 1888 and 1889. He also turned out on several occasions for Fifeshire. Alex died in Natal Place, Cowdenbeath aged 72 in 1934 (Harry lived in School Street. He died in Cowdenbeath in 1909 after a stone fell on him in an accident in Foulford Pit. Bob died in Coaltown of Wemyss in 1928).